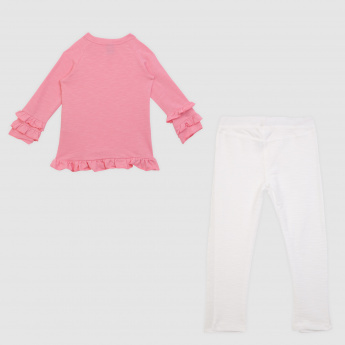 Make your little darling look adorable my dressing her in this lovely set of clothing. Sporting an enticing print on the front, this t-shirt looks appealing and is fashioned with a frilled detailing for added appeal. The jeggings are comfortable to wear, owing to their soft make.